Our IU family — a cheerleader, Coach Bobby Knight, and a basketball. I know it’s been awhile since I last posted. I’ve been a little preoccupied — we’re finally moved into our new house in Greenwood! Between the last-minute packing, cleaning, closing on the house, and unpacking, it’s been a busy couple of weeks! Luckily, we had the help of our families and a few friends during the move. We couldn’t have done it without them! I realized with this move that Greg and I have moved every year, on the year since we got married three years ago — one year at our first apartment, one year at our second apartment, one year in Avon, and hopefully the next decade or so in our new house! And for each of these moves, our family has helped us move boxes. Amazing! In the time since my last post, we also celebrated Halloween. We went to a party at our friends’ house and were able to take Hannah since two other babies would be present. 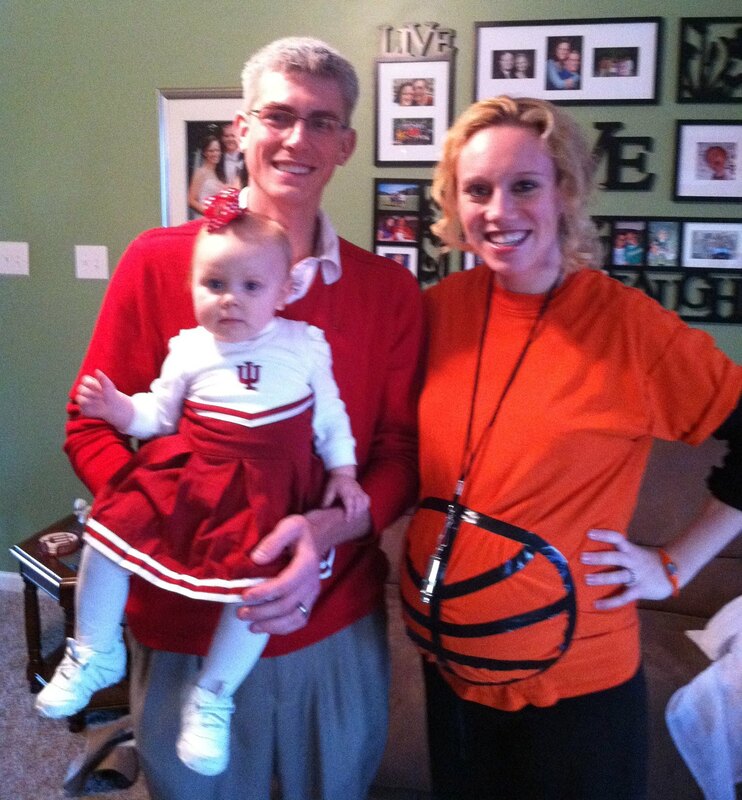 We coordinated our costumes and went as an IU basketball family. It was lots of fun and we enjoyed catching up with our friends from college. My extended family in Southern Indiana also got together for a Halloween party. I would’ve loved to go, but some recent lower back pain has prevented me from being in a car too long and I was worried that something might happen while I was so far away from home, so unfortunately, we weren’t able to go. I really wish we could’ve gone since I know we won’t be down there for Christmas with the babies coming at that time, but my mom, dad, sister, and brother went. We Skyped with everyone at the party and they got to see my big belly! It was fun to see them too. I am so touched by my family’s words, thoughtfulness, and generosity. It’s been a long time since I’ve seen them all together — probably as long ago as last Christmas — and I miss them. But, I can feel their love and support for me and the babies radiating all the way up to Indy! Thank you all for such a lovely surprise. 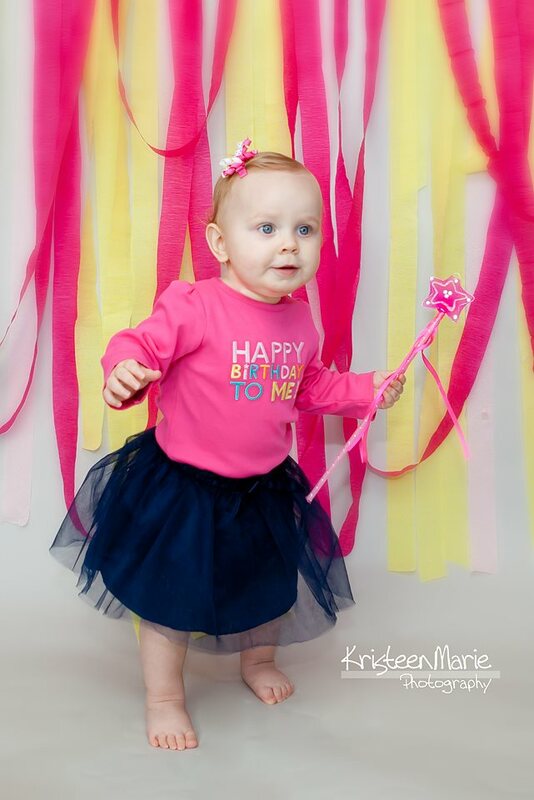 This past weekend was a special one — my baby girl, Hannah, turned one year old. (tear) I can’t believe it. I was very nostalgic the whole day, remembering what we were doing at that exact time one year ago. Hannah gave me the perfect pregnancy with the perfect delivery — no complications, only 7 hours of labor, and a healthy, 8 lb. baby. We will celebrate this big milestone this weekend with a cupcake decorating party with the family! (pictures of Hannah devouring icing to follow) Speaking of pictures, we also had Hannah’s one year pictures taken by my friend, Kristeen — our designated family photographer! 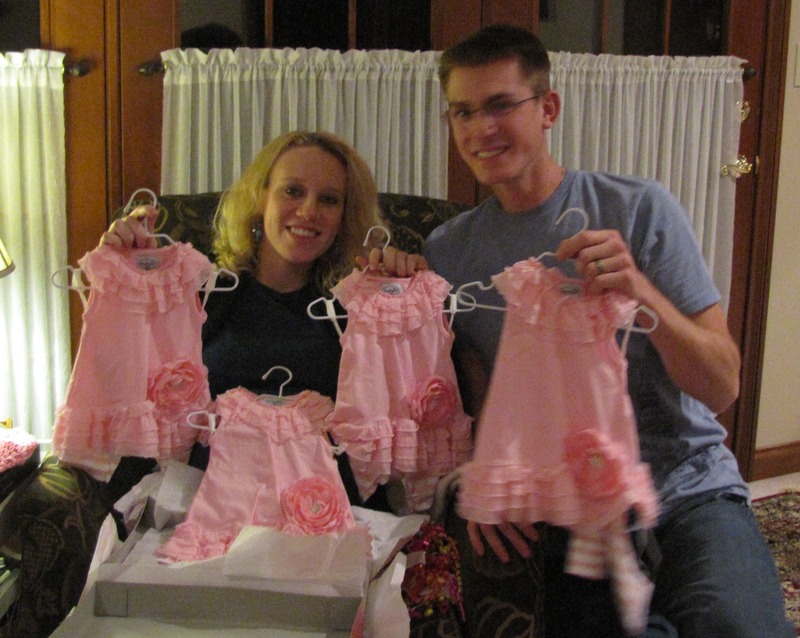 (She took Hannah’s newborn and 6-month photos as well.) We had a lot of fun this shoot because Hannah can actually stand and walk on her own now. The pictures are still being edited, but we got a little preview. A mother’s job description is to help her kids with whatever, which includes moving them every time that they need it !! I know that you are feeling better that the move is over, and you can settle in now — we enjoy seeing Hannah a lot more ! Love all of you guys! YES!! You made it to 28 weeks! So glad that all the girls are doing well, mom included! 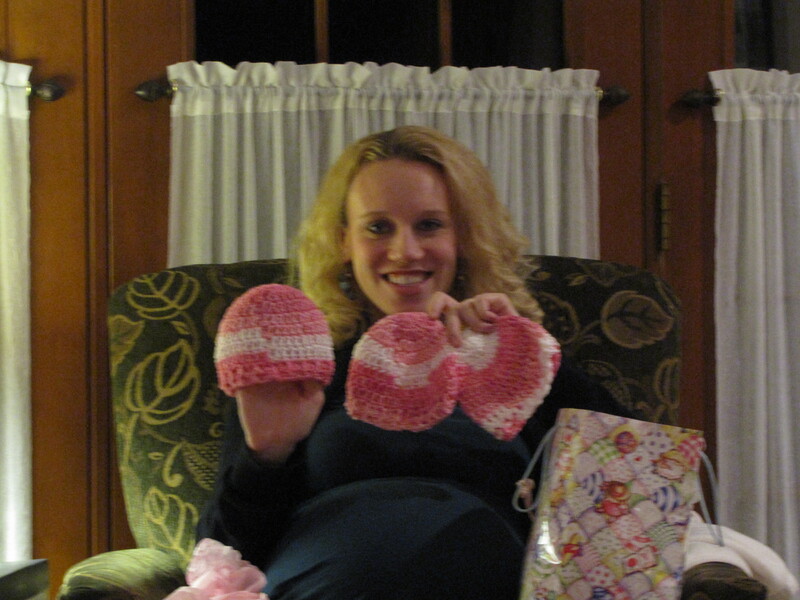 Just think I had Alleyna at 28 weeks so it can be done. 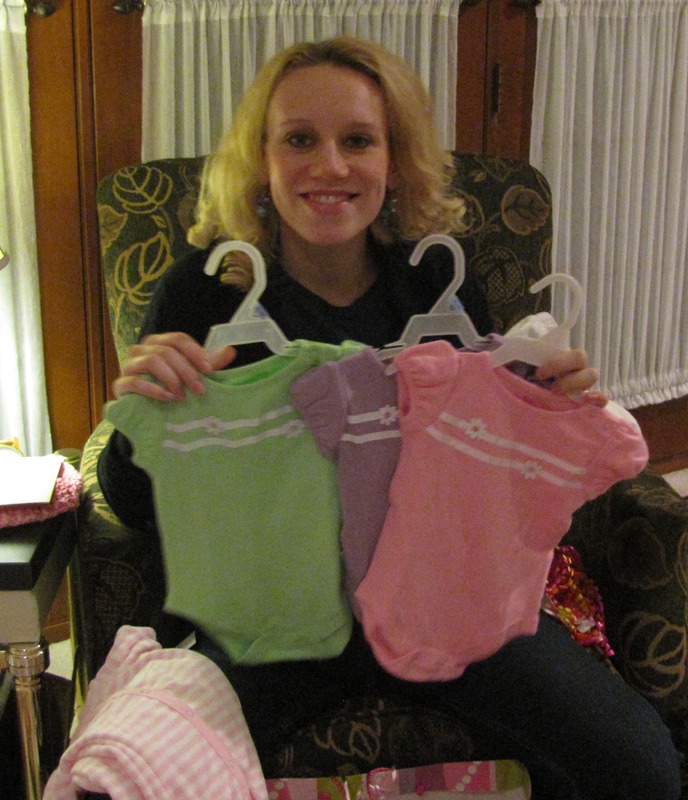 Time to pray that their little lungs continue to develop~another preemie hurdle. Think right now that Greg’s wedding band would probably slide up one of their legs. Tiny miracles. We loved spending some time with Hannah on Friday. Alleyna was in heaven and said that she would come play with Hannah any time. I’m pretty sure that Hannah was having fun too. Love you all! Woohoo!! 28 weeks and still looking great!! Keep going Steph. Each week just gets your 3 little pumpkins a little stronger. You can do this! You have a tremendous family – what fantastic support and love:).